"When someone takes you where you do not know and yet, all along the way, God continues to provide, it is an adventure. And there is nothing more beautiful." Sofia Cavalletti - co-founder of Catechesis of the Good Shepherd. Catechesis of the Good Shepherd has been defined as "the meeting of two mysteries: the mystery of the child and the mystery of God." For many years the Catechesis of the Good Shepherd (CGS), which has now spread around the world, has sought to grow in the understanding of these mysteries by embracing the Montessori theory of education—an emphasis on independence, freedom within limits, and respect for a child's natural psychological, physical, social and spiritual development. ​The Catechesis of the Good Shepherd is a unique approach to catechesis, through which the youngest children build deep, lifelong relationships with Christ and his Church. The program began in Rome, during 1954, when Sofia Cavalletti and her Montessori collaborator, Gianna Gobbi, accepted a challenge from a mother. Knowing that Cavalletti was a Hebrew and Scripture scholar, the mother asked, and then insisted, that Sofia give her 7 year-old son some religious instruction. Sophia finally consented and she and Gianna, much by accident, began to develop methods for them to talk about and with God in a manner that opened and enthused the mind of the child. ​From that day to the present time Sofia and Gianna have reminded us to look to the child for that sign of a deeply religious life - joy - and to always ask the question: "What face of God is the child telling us he or she needs to see?" The Catechesis of the Good Shepherd has grown and spread. At last count it is in 37 countries: Australia, Austria, Argentina, Bolivia, Brazil, Canada, Chile, Colombia, Croatia, Ecuador, England, France, Germany, Guatemala, Haiti, Honduras, Ireland, Italy, Japan, Kenya, Mexico, New Zealand, Norway, Pakistan, Panama, Peru, Poland, Puerto Rico, Serbia/Bosnia, Slovenia, South Africa, Tanzania, Uganda, Uruguay, the United States, and Venezuela. In the summer of 1983 Sofia Cavalletti traveled to Washington D.C. to offer a course that included materials for children and discussions on the theme of the Eucharist. At that time a series of meetings and discussions ensued that eventually led to incorporation of the National Association of the Catechesis of the Good Shepherd, USA. When the association was incorporated in Maryland, in October of 1986, it listed 54 members. Today there are two national offices: the National Director's Office in Scottsdale, AZ; and the Formation Office in Marietta, GA. We have 2,000 members, about 173 formation courses for adults and more than 120 leaders who offer the courses. In the United States there are at least 1,250 Atria in Catholic, Episcopal and Orthodox settings as well as in several other Christian denominations. ​The St. Paul - St. Ambrose Catechesis of the Good Shepherd program is administered from and taught at the PSR Building at 311 Washington in St. Paul. At the present time the parishes have five recognized level one CGS catechists. These catechists work under the direction of the Director of Religious Education; and are assisted by one of the few degreed CGS formation leaders in the United States . Our program is new and at present the facility is limited by space. We dedicated three rooms in our PSR facility as atriums for Kindergarten through fourth-grade students. With the grace of local assistance, these atriums are being furnished with beautiful, yet simple materials to help our children learn by interacting with objects of our faith. Materials prepared for the children's use in the atrium are not designed to lead to abstraction, but to a vital knowledge on a concrete Person—leading not to consideration of ideas, but to facilitate meditation and lead to prayer. The material in the environment, designed for the personal work of the child, is meant "to put the child in touch with those 'sources' through which God reveals and communicates Himself in living form. The materials "concretize" the religious realities, both from the Bible and liturgy, which are proclaimed or "lifted up" in the atrium. The materials help "to make realities tangible and visible for the child and help to adsorb them. For example, students can actually experience the actions of the Holy Mass by using models of the altar, chalices and other materials. St. Francis PSR Building Atriums. A radical departure from the usual formation of a volunteer catechist is the extensiveness of the formation in the catechesis. It is this in-depth training that is one of the great strengths of the Catechesis of the Good Shepherd. "The most carefully prepared environment will be of little use if the catechist, himself or herself, is not carefully prepared." (Gobbi) The task of the catechist in the Catechesis of the Good Shepherd is to "bring the environment and materials to life..." The environment and materials speak to the child without words. Formation is given on three levels. Each formation level consists of about 90 clock hours. Level one explores the general principals of the Catechesis of the Good Shepherd. Level two builds on what children have experienced in level one. Level three goes further, developing themes suitable for older children. 1. 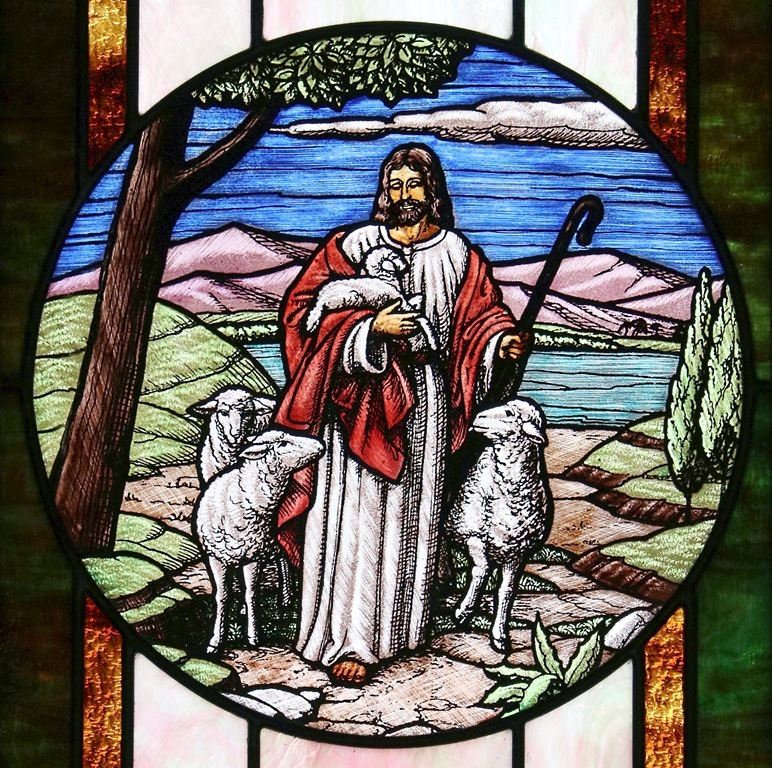 The stained-glass window photo is the Shepherd Window in St. Ambrose Catholic Church, Erie, KS. Photo by the webmaster. 2. Sophia Cavalletti and Gianna Gobbi continue to instruct us through their memories, writing and instruction. Sophia passed away on August 23, 2011 and Gina passed on January 29, 2002. 3. Atrium (Pl. Atria). In simplest terms an atrium is a specially prepared room. In the early church, the atrium was the place where the catechumens were prepared. For the child, an atrium is a place of preparation for involvement in the larger worshipping community. ​4. In 2010 parishioner and educator Frances Casey received her Master of Arts in Pastoral Studies—Catechesis of the Good Shepherd, offered by the Aquinas Institute of Theology at St, Louis University. She was a member of the first cohort to receive this degree. In addition to her work with our parish, she is assisted by two other catechists (Sharon Compton, Our Lady of Lourdes, Pittsburg and Marcia Helten, Christ the King/St. Mary of Derby). They have given formation courses in Augusta, Derby, Pittsburg, Chanute and St. Paul. During a period of late 2010 through present they have worked with over one hundred catechists from more than thirty diocesan parishes and the Diocese of Colorado Springs. This has included catechists from Fort Scott, Pittsburg, Chanute, Independence, Winfield, Hutchinson, Augusta, Newton, Frontenac, St. Paul and Wichita. The Catechesis of the Good Shepherd website is a good source of information regarding the United States organization. The site includes history, the mission, FAQ's, downloadable material and many more resources needed to understand, start and run a CGS program at the local level.